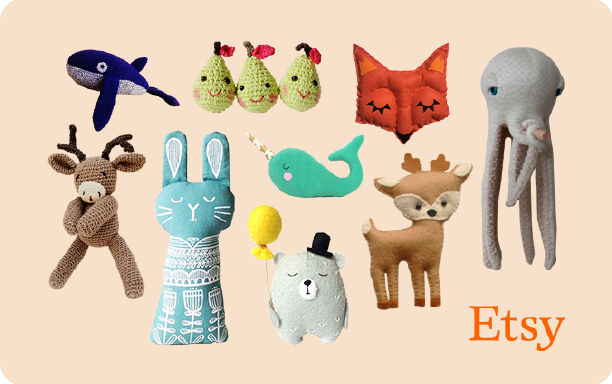 Enter this giveaway for a chance to win a $50 Etsy gift card. Good luck! I like all bookish things. Book marks, toes and stuffed anomals are among my favorites. What a good question, I like bookish items because they show that I love books. I favour mugs the most so far. I love how cute and quirky some of them are. At the top of my wishlist is a crochet bookmark. I love how they remind me of books and the person who gave them to me. I love bookmarks and coffee mugs. I love being able to support creators who are passionate about books as I am! Currently I have a lot of bookish themed enamel pins to decorate my denim jacket with. Thanks for the chance to win! Coffee mugs are my favorite, but I also like pens, notebooks and bookmarks. I like that they're unique, they aren't the sort of thing you find in every store, and my favorite thing is probably pretty bookmarks. Handmade bookish gifts are precious and unique! Bookmarks at the top of my list. I love how they reflect my love for reading. And at the top of my wishlist ... I've been eyeing literary scarves on Storiarts for quite a while, those are awesome! I like them because they are fun and unique. I love handmade bookish items because of how special and unique they are; a book sleeve is at the top of my wishlist. "What do you like the most about handmade bookish items and what's at the top of your wishlist?" I love beautiful illustrations, and would love to collect beautiful book illustrations! I like that they are unique & interesting. Journals/notebooks are my favorite. I love having something to remind me of a book I enjoyed or simply something unique to show off!! Love books and fridgies most! Well, aside from bookmarks! Bookmarks because I use them! I love them because I feel like I'm supporting 'the little guy' rather than the big companies... and I like all kinds of things but a special coffee mug to go with a great book is awesome. Or a book nice book cover/bag! They have great quotes on. I would love more bookish items. I really love bookmarks because I use them! Mugs are my favorite, but I also love bookmarks! I like to surround myself with cute things, and especially things related to books. It makes me happy. I love bookish tees than I can share my love of reading with everyone, especially my students. Bookmarks and mugs are great and Im in need of new mugs. Everything is so pretty, and when I know that it's hand made... amazing! I love mugs, and those little things that you can barely find and are a real treasure for me. I love all items, but have some lovely bookmarks. I adore anything unique and quirky. Handmade items are unique and good quality. My favorite bookish item is tote bags. Love them as they have a personal touch, I will love few book covers. Love that someone took the time to handmake something. That is special! Love coffee mugs and totes! I love bookish bracelets and necklaces especially the unique ones. I love the unique nature of homemade bookish items! I love things like these booksleeves as I always carry a book or my ereader on me! What i like the most about handmade bookish item is the creativity behind a beautiful thing that at the same time reminds me of book, which i love. Brooch, purse is on top of my wishlist. The Sherlock Holmes Beekeeper brooch looks awesome. The love and time that go into them and each one is slightly unique as is handmade. I love the crochet and felt bits and pieces - would like to get some bits for the Christmas tree this year. Etsy is such a good site - lovely items on there. Wish I was that talented! Bookmarks and mugs for me! I love the thought and effort that goes into making them. The initial idea behind the item and the thought that goes into making the "idea" a reality. I love the tote bags especially ones which have a pun on a literary theme, ie the "Talk Darcy to me" which I saw on your blog too. *sorry I should have to "and mugs" after the tote bags, as the quote I wrote was on a mug. Sorry, lack of coffee today lol. Dress up a couple of pants. Charlize Theron Wrinkles I realize we spruce up for work five days a week and we need multi day where we can simply tone things down and unwind.